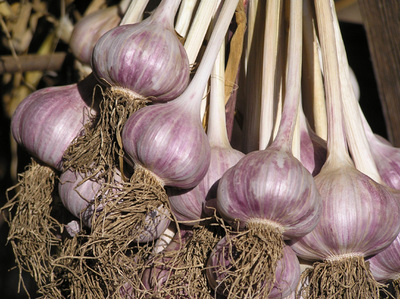 Celeste is one of the few Glazed Purple Stripes available and they're fabulous garlics that grow well in most climates although iffy in the warmest winter areas. Their bulb wrappers show a different texture than either the main group of Purple Stripes or the distinctive Marbled group. Celestes are tall plants with dark green very elongated leaves with a definite blue cast to them in the sunlight. Their leaves longer and thinner than and not as wide as the Marbled group while the main group are clearly smaller. Glazed Purple Stripes are the tall willowy maidens of the garden and are usually the tallest garlics. 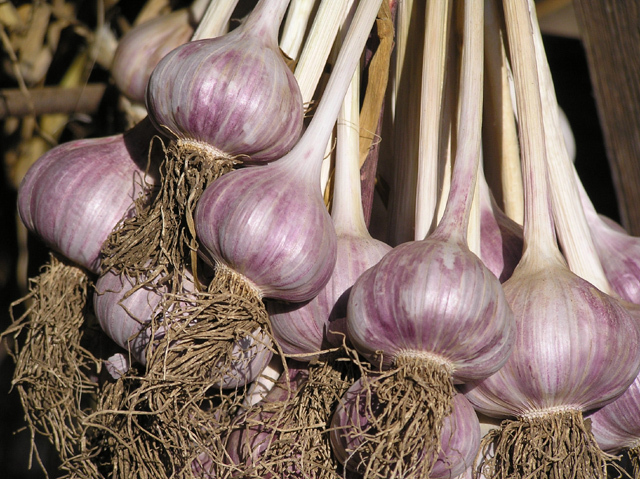 With good growing conditions the bulbs can get very large, 2 1/2 to 3 inches in diameter. The inner bulb wrappers of Celestes can be almost solid purple with purple clove colors and they are very beautiful bulbs of very rich color and they are a lovely addition to the table centerpiece until you're ready to eat them. If you want to flash some stark, raving color to get someone's attention, these garlics will do the job. Celeste's bulb wrappers are sleek and parchment-like and the outer ones are very, very white. As you peel away the outer wrappers more and more purple striping shows up and they become almost solid purple by the time you get down to the cloves. The clove covers are dark brown with purple streaks and long sharp pointed tips. The cloves are more elongated than the Marbled ones or the main group but all have the characteristic extremely elongated clove cover tips, some several inches long, unique to the Purple Stripes. 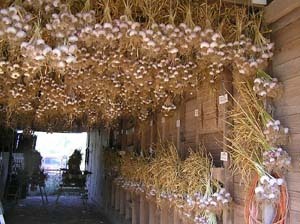 Order Celeste from Celeste Garlic in OK now for shipping in the fall.